Japanese artist Tadashi Kawamata created the soaring 20-foot-high dome made entirely from stacked chairs! Dubbed 'Chairs For Abu Dhabi', the unique ready-made structure invited people to walk through it and take a rest in one of the comfy seats inside it. Born in Hokkaido, Japan, Kawamata has been featured in important international events from a very young age. He creates smashing art installations using scrap materials and repurposed objects like pallets, waste wood, and in this case hundreds of assorted chairs. Made from a mixture of all kinds of seats — including armchairs, sofas, benches and stools – the habitable sculpture pays homage to humanity’s diversity, unity and interconnectedness. It took Kawamata five days to build Chairs For Abu Dhabi, a brilliant structure that reaches the gallery’s 20-foot-tall ceiling. The art piece was one of the main attractions at Abu Dhabi’s 2012 biennale, where it provided the bustling event with an iconic eco-friendly pavilion that was difficult to miss. Formidable, convenient and unique, the shelter served as a popular meeting point throughout the festival. Born in Hokkaido, Japan, Kawamata has been featured in important international events from a very young age. Formidable, convenient and unique, the shelter served as a popular meeting point throughout the festival. He creates smashing art installations using scrap materials and repurposed objects like pallets, waste wood, and in this case hundreds of assorted chairs. Made from a mixture of all kinds of seats -- including armchairs, sofas, benches and stools – the habitable sculpture pays homage to humanity's diversity, unity and interconnectedness. 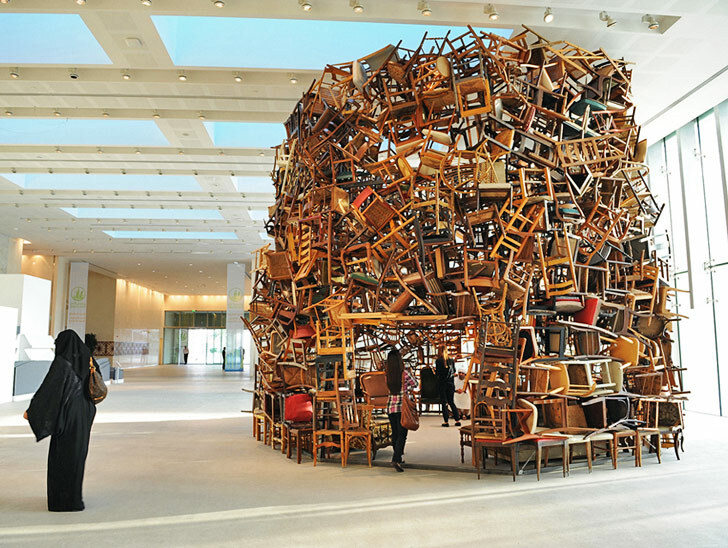 It took Kawamata five days to build Chairs For Abu Dhabi, a brilliant structure that reaches the gallery’s 20-foot-tall ceiling. The art piece was one of the main attractions at Abu Dhabi’s 2012 biennale, where it provided the bustling event with an iconic eco-friendly pavilion that was difficult to miss. Born in Hokkaido, Japan, Kawamata has been featured in important international events from a very young age. 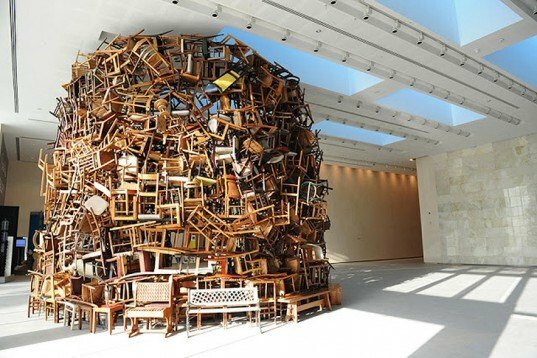 He creates smashing art installations using scrap materials and repurposed objects like pallets, waste wood, and in this case hundreds of assorted chairs. Made from a mixture of all kinds of seats -- including armchairs, sofas, benches and stools – the habitable sculpture pays homage to humanity's diversity, unity and interconnectedness.